Our Charlottesville Area Association of Realtors has just released the latest real estate market report showing stats for sales in our area, 2018 3rd Quarter. Home sales climbed 4.4% (1,051) compared to Q3 2017 (1,007), led by an increase (16.5%) in attached homes. 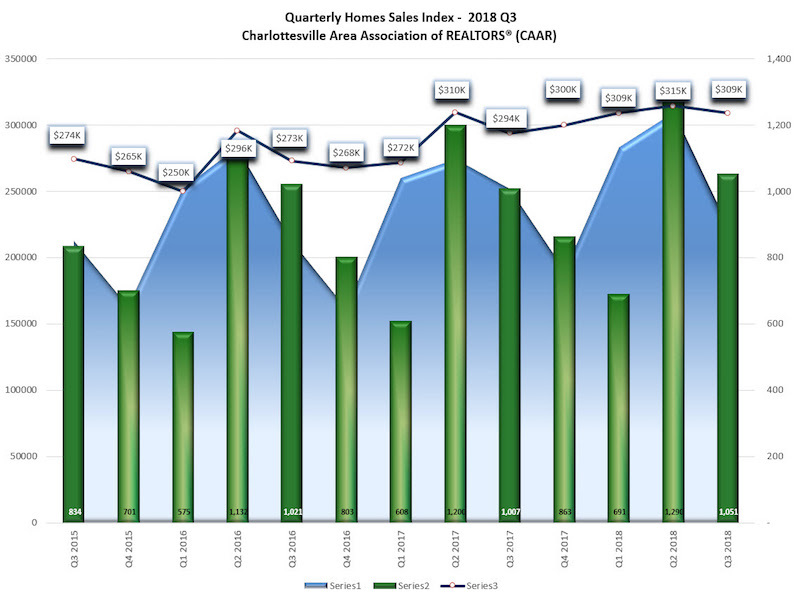 Greater Charlottesville median sales price rose to $309,000 (5.1%) compared to this time last year ($294,007). The median days on the market in the 3rd Quarter was 56, 6-days lower than in Q3 2017. New listings increased 2.5% (1,167) compared to Q3 2017 (1,138), as pending sales dipped slightly by 0.4% (896) compared to this time last year (900). Inventory of homes for sale declined -9.3%, resulting in 3.9 months supply of inventory compared to 4.3 months supply in Q3 2017.